A flute is a reedless wind instrument that is held horizontally and creates sound when a person blows into a hole on the mouthpiece. The clarinet has a cylindrical bore and a single reed. The reed produces vibrations as air from the mouth flows across it and when it is attached to the mouthpiece, according to Virginia Tech's Department of Music. To learn the differences between the flute and the clarinet, you will need to examine their parts. The clarinet mouthpiece has a ligature, which holds the reed onto the mouthpiece. The reed for the mouthpiece vibrates and creates the sound for the instrument. Flutes, on the other hand, don't have reeds. 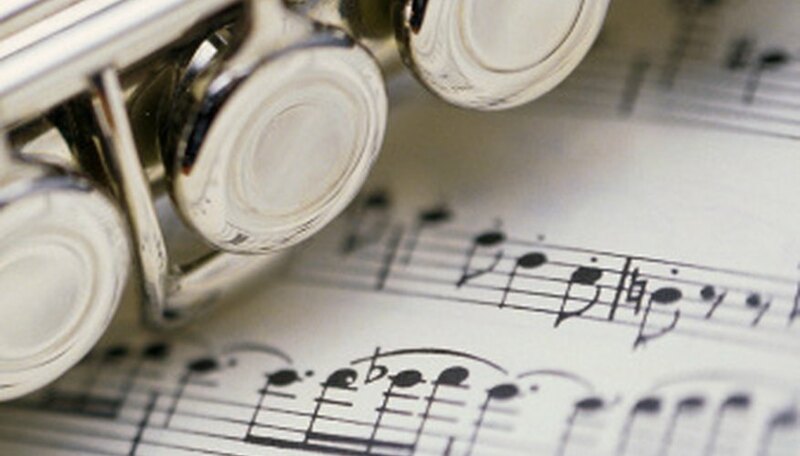 Flutes have a head joint that has a lip plate or mouthpiece to blow into in order to make music. The clarinet has a barrel. The barrel is used for tuning and comes in a variety of sizes. The flute doesn't have a barrel. However, the flute has a head joint cork used for tuning the instrument. The flute has a piece called the body, which is composed of the right hand stack, left hand stack and G keys. The clarinet has two joint pieces: the upper joint and the lower joint. The upper joint and the lower joint have the register keys and the trill keys. The flute has a foot joint that only consists of three keys. In contrast, the clarinet has a bell at the end of its instrument that is used for tuning purposes only. Sound is also projected from the clarinet's bell.